Easy to read text; excellent collection of scale plans for major and minor variants; competent colour profiles and a selection of “walk-around” photographs. A “one stop” publication that is recommended to anyone that is either interested in, or modelling, this fascinating aircraft. The Messerschmitt Me 163 continues to fascinate Luftwaffe fans. Starting out as a study into tail-less aircraft design, Alexander Lippisch’s brainchild evolved from his trials with the DFS 194. When coupled with the Walter HWK 109-509 rocket engine, speeds were attained that made the proposed fighter virtually untouchable. When it did finally make it into service, the motor’s voracious appetite didn’t allow the fighter enough endurance to successfully take on the approaching Allied bombers. Another concern was the volatility of the fuel, not to mention the need to glide back to your airfield and make an unpowered landing on the undercarriage skid. In the end it was an aircraft that proved to be more dangerous to its pilot than to enemy aircraft. However, as the world’s first and only operational rocket powered fighter, it will always have a special place in history. The fact that this aircraft was a major item of study after the war, resulted in many examples surviving until this day. This volume is the latest in MMP’s popular Orange Series and takes a comprehensive look at this famous interceptor. Inside the soft card covers, one finds 160 A5 sized pages. Included are a collection of period and contemporary photographs that number well over 200. Nearly 3/4 of these are in colour, and relate to preserved museum examples from around the world. They are grouped in the familiar “walk-around” format and cover all areas of the airframe. Extra emphasis has been placed on the cockpit, and undercarriage assemblies (skid/ dolly) as these are the parts most under scrutiny from modellers. The resulting close-ups also give the viewer a better appreciation of the subject, than would otherwise be the case with wartime images alone. Complimenting this collection are some welcome diagrams from the official parts manual. Scale drawings are a big feature of this publication and they can be found scattered through the text. The subjects portrayed here are the Me 163A in early, late and final forms, various incarnations of the Me 163B, and of course the Me 163S. Additional profiles can be found of the DFS 194, Me 163C, Me 163D and Ju 248. For those that prefer the smaller size of 1:72, a separate fold out set of plans is also supplied. Due to space limitations, the aircraft displayed on this sheet omit the last 4 subjects mentioned above. Twenty pages of colour profiles illustrate the colours and marking found on these machines. They’re up to the usual high standards expected from the artist and show a diverse range of schemes and aircraft sub-types. The narrative is easy to read and starts with an introduction to the pre war experiments undertaken with tailless aircraft. We proceed quickly through to the development of the Me 163A and B models before looking at the armament, production and service life of these aircraft. The limitations of the design were seen at an early stage in its career, and there were attempts made to fix these. 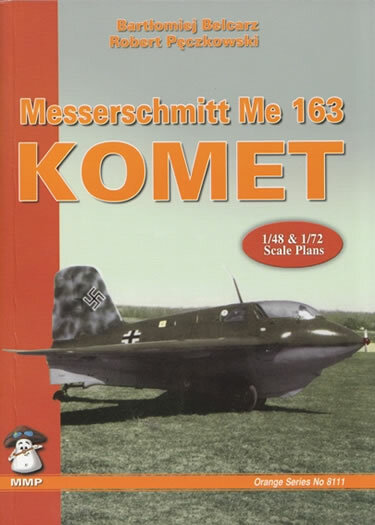 The resulting projects are taken up in the next couple of chapters where the Me 163C and Me 163D/Ju 248 are introduced, along with a discussion of the Me 163S two-seat trainer. After the war, various countries had the opportunity to test these revolutionary machines and a section relating to their acquisitions is also included. The “Orange Series” of publications are an ideal way to collect concise information on a variety of aircraft. Not only does the book provide a history of the aircraft, it also supplies scale drawings, colour profiles, and a collection of “walk-around” photographs. Thus it’s an ideal reference source that will benefit both modellers and fans of Luftwaffe aircraft alike.